The Easter Road side had gone into the match top of the pile thanks to a superior goal difference over second-placed Celtic, who also had a game in hand. But this defeat means they now trail the Celts, who beat Ross County 3-1, by three points and, with only two matches remaining, their hopes of taking the title to back up last season’s Development League triumph appear to have faded. The Edinburgh club fielded a strong side in Glasgow with Ryan Gauld, Thomas Agyepong, Gael Bigirimana and Jonathan Spector all in the starting line-up and got off to the perfect start with two goals in as many minutes. Gauld was on hand to slam home the opener after Oli Shaw’s shot had broken off a Rangers defender before turning provider, his free-kick headed home by Shaw. But Rangers hit back, Glenn Middleton curling the ball beyond Adam Bogdan before claiming his second of the game, pouncing to fire in the rebound after the Hibs goalkeeper had saved Cameron Palmer’s effort. Hibs went close to regaining the lead two minutes before the interval but Sean Mackie’s shot crashed off the post. 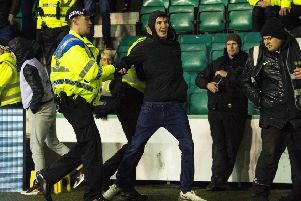 The Easter Road side were left to play the final 26 minutes a man short after Fraser Murray was shown a straight red card following a clash with Palmer. Substitute Innes Murray pulled a good save out of Rangers goalkeeper Kieran Wright before Bogdan did likewise, denying Middleton and Stephen Kelly in the space of a minute. But, with just six minutes remaining, Kelly fired a free-kick beyond Bogdan after Gael Bigirimana was penalised for a foul. Hibs: Bogdan, Stirling, Spector, Johnson, Mackie, F Murray, Gauld (Donaldson), Bigirimana, Agyepong (I Murray), Shaw, Allan (Gullan).